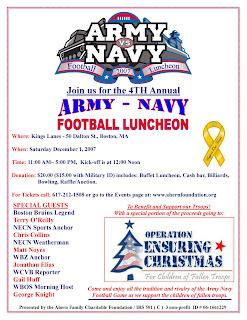 Coming up next week is the 4th Annual Army-Navy Football Luncheon - on December 1st at Kings in Boston. The event will raise funds to support Operation Ensuring Christmas, a non-profit organization that provides financial, moral and rehabilitative support to the children of American soldiers who have been killed since September 11, 2001 in Iraq and Afghanistan. In addition to watching the 108th Annual Army-Navy football game at Kings, the event will include a buffet luncheon, billiards, bowling and a big silent auction. NECN’s Chris Collins and Matt Noyes will be joined by Bruin’s legend Terry O’Reilly, WCVB’s Gail Huff, WBOS morning announcer George Knight , WBZ-TV’s Jonathan Elias and others as hosts of our event. The luncheon begins at 11; the game at 12noon. Tickets to the Fourth Annual Army-Navy Football Luncheon are $20 ($15.00 with military ID). Click (here) to get your tickets. 0 Response to "ArmyNavy Football Luncheon - 12/1"